A week ago, clashes erupted between Indian security forces and protestors just outside the Jamia Masjid Srinagar. What followed was scary, but was not happening for the first time. A police vehicle ran over two young boys; one was seriously injured and the other one, Qaiser Amin Bhat, died of his injuries at the Sher-e-Kashmir Institute of Medical Sciences (SKIMS) later on the same day. The incident was not something new; one such incident had already taken place in Srinagar earlier in the month, when a police vehicle ran over a youngster, Adil Ahmad Yadoo, killing him on the spot. Earlier, Kashmiris were being used as human shields, but now, Kashmiris are being openly killed. What was previously done via bullets is now being accomplished through vehicles. Nothing seems to have changed – death is still dominant in the valley, and has now taken the front seat. After the incident that occurred outside Jamia Masjid, the Indian media started circulating a one-minute video to malign and question the role of the resistance leadership (known as Joint Resistance Leadership). This act on the media’s part only further uncovers its biased nature. In the video, a youngster can be seen overcome with emotion, asking critical questions regarding the conduct of the leadership on certain issues. But in no way is he trying to tell them they have been a failure and are not relevant anymore. Instead of running the entire 15-minute video, the Indian media preferred to run an oddly pulled out minute of it, and conveniently interpreted it in a way that suited them most. 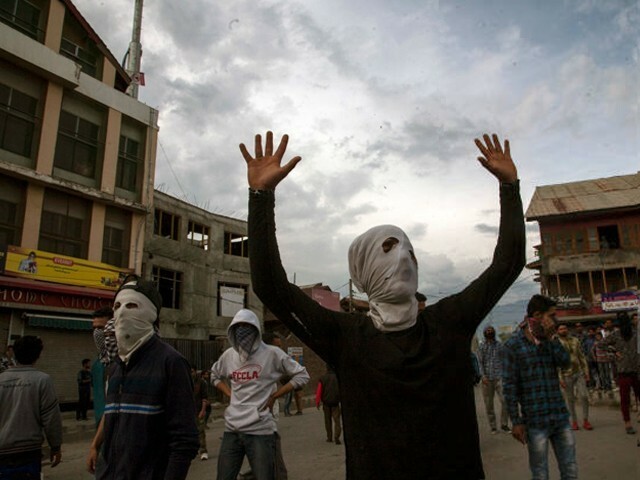 They tried to establish that Kashmiri ‘separatist’ leadership – as they call them – has failed, and that young Kashmiris no longer believe in them. They asked ‘brave’ questions on primetime shows, such as “is Hurriyat relevant?” and so on. Thus, there is a lot of fuzz going on these days on Indian primetime television, bereft of meaning and purpose, aimed at character assassination, and devoid of ethical journalism. If anything, the major take away from the video is that the Kashmiri youth are brave and sensitive enough to ask questions; even at a point when they are offering immense sacrifices – their lives – almost every day. What it does not suggest is that Kashmiris have lost all faith in their leadership, and that there is total defiance amongst them, which is what the Indian media is trying to project. This really isn’t the case, for soon after the Indian media presented this video out of context, the young man seen in the video appeared and cleared his stance. He termed the leadership as the “elders of the family”, to whom they could “ask questions” without fear. However, just like the content of the earlier video, the Indian media preferred to ignore the facts and chose whatever covered its purposes. There were no takers to this man’s clarification, despite the fact his original video was shown on nearly all major networks. Ironically, nobody has been talking about the youngster who was killed when a vehicle ran over him, or about those who were killed earlier. Nobody! In a way, the Indian media glorified those who killed the youth by not talking about the incident at all. After all, killings of Kashmiri youth do not make it to primetime shows. The same thing happened in April last year, when Major Leetul Gogoi used Farooq Ahmad, a resident of Jammu and Kashmir’s Budgam district, as a human shield to escape heavy stone pelting in the area. Nobody was brave enough to question the action of the Major; rather, he was appreciated for the move by the media, and even his superiors patted him on the back for his “creative approach”. While laurels were bestowed upon Gogoi, Ahmad was denied compensation despite the extreme suffering he was put through. This is the irony of Kashmir, where the tormentors are appreciated and nobody tries to talk about the common Kashmiris who are at the receiving end of this unending mayhem. Those who are being maimed by pellets, those who are mowed down and killed every day under police vehicles; nobody seems to care about them at all. They are lost in the narrative. The fact of the matter is that Kashmiris are not tired of offering sacrifices every day, but at the same time they are vibrant enough to ask questions about what’s next for them. In no way can this be portrayed as a sign they have lost faith in those who represent them, and portraying it so is extremely damaging to their cause. This entire video fiasco has once again reinforced the jingoistic image of the Indian media when it comes to Kashmir. They may be doing good work on other issues in India, but when it comes to Kashmir, their tone changes, and so does their approach. The Indian media may have carried out sting operations to uncover the ‘dirty rats’ among them, but they are all one and the same when it comes to Kashmir. Kashmiris may not be able to control the narrative being generated by the Indian media, but the video that has surfaced should compel them to contemplate what is going wrong and where their shortcomings are. While the Indian media uses the video for their own purposes, the Kashmiris, especially the leadership, should use it for their own. Perhaps the most important lesson for them will be to ensure further opportunities do not arise for the jingoistic media to use such moments against them in the future. Having said that, the Kashmiri leadership should also spare a moment to think about the questions being raised here. They cannot go on avoiding the tough questions. After all, it is worth questioning whether the sacrifices they have offered are worth the enormous repercussions they have paid thus far. Why was the “young” “Kashmiri” boy running towards the CRPF vehicle and throwing stones at them? At his age people go to school and focus on their study. Kashmiris should thank India, frankly. The borders between India and Pakistan have been created by history. Any other country would have just asked them to leave, if they did not agree. Even Pakistan let all its minorities like Sikhs and HIndus t leave country. hoods of army jeeps and parading around. Like displaying hunted deer. chase the soldiers away, armed with deadly frying pans, ladles, shoes. a spoonful of bhaji [vegetable puree] add a cup of tea. That leaves the soldiers robbing the school bound kids of their lunches. “…trying to kill the soldiers…” with what? with rocks? shoes? chappals? trash bags? left tied to holy trees? mangos? jamuns? gol guppas? So far, a Kashmiri grandmother is equal to 10 soldiers with her trusted ladle in hand. to maintain and control Occupied Kashmir. It will drain Hinduland. Well, Modi Sarkar, said no need for Fiscus or Discos ID. Hate Propaganda currently being printed in Hindustan. Sure, heard of it from the UNCRC.